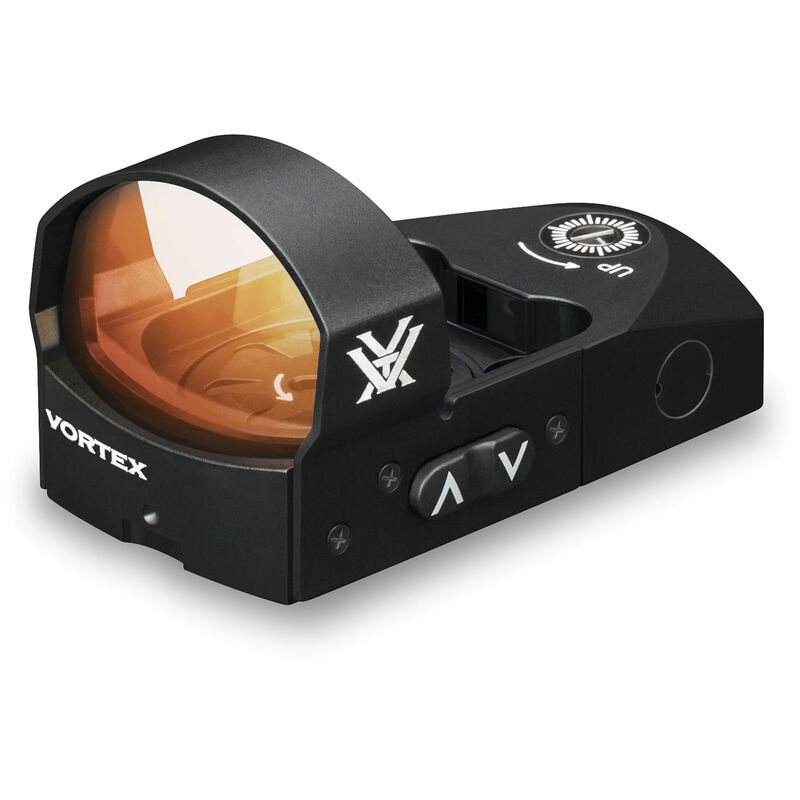 Get an upper hand in close quarter combat with the Vortex Optics Venom Red Dot Sight. This ultra-compact and lightweight yet durable sight provides a 6 MOA Red Dot reticle for laser-sharp precision in target acquisitions. You will also be able to fine-tune your accuracy with the ballistic and windage compensation controls that allow 1 MOA per click adjustments. The reticle provides 10 brightness levels to deliver ideal illumination of the red dot for given lighting conditions and features an auto shut-off to save battery and a runtime of 150 hours at maximum brightness. To help the reticle achieve its purpose, the optics offer a fully multi-coated lens that provides a wide angle of view with exceptional edge-to-edge image clarity. To ensure quality of service for years to come, the lenses are also treated with ArmorTek protective coating that defends against scratches, abrasions, dust, and oil stains. The compact, lightweight, and durable aluminum housing features a single-piece chassis, anti-corrosion and anti-scratch Type III hard anodizes finish, and waterproof and impact-resistant performance. Also included with the sight are a Picatinny mount, a CR-1632 battery, and a Torx wrench. Box Dimensions (LxWxH) 6.6 x 5.25 x 2.55"
Venom Red Dot Sight (6 MOA Red Dot, Matte Black) is rated 4.9 out of 5 by 19. Rated 4 out of 5 by Mark from Briz from Venom 3 moa review I bought this for my walther q5. Bolted on with no problems using the doctor plate. Build quality is good. Sighting in was very straight forward. Accuracy was incredible. The RO commented that this combo of walther and vortex sight was more acurate than their open gun. The only thing i would change would be the ability to set an upper and lower threshold for the auto brightness. I really wanted to use this feature, but it seems to default to being too bright even in overcast conditions causing flare and distortion of the dot. This means i need to abandon the auto brightness and manually set for the relevant lighting conditions. Rated 5 out of 5 by Tootie from Very Easy on the Eyes, Grief for the Varmints I got my Venom about a month ago. When I first opened the package, I wasn't prepared for the small size of the unit. I had thoughts that I might have made a mistake and should have bought something larger. I haven't tried it on a handgun but brother, it makes my AR's shine. So far, it's Old Dad (11) Squirrels (0). I can't tell you how happy I am with this red dot. I have a couple others but none compare. The operation is easy - nothing hard to turn or gritty - smooth and efficient and I love the fact that the battery will last. And when it does need replacement, it can stay on the firearm for the change-out. Rated 5 out of 5 by Mike B. from 6 MOA on Glock 17 MOS I have the 6 MOA on a Glock 17 MOS and so far it is pretty awesome. I have only had it the range a few times and I do dry fire practice every day. I put this on a range / informal match gun to see if a RDS was right for me. 54 years old and I wear glasses, it did take a little getting used to. 1) Getting used to finding the dot rather than the front sight takes a little training. 2) The dot moves and seems less forgiving than the iron sights, but this is perception. If you move while aiming, it does not matter what you have. Mounting on plate 1 made for a perfect fit on the G17 MOS. No milling required and all the screws between the sight and gun worked perfectly. I used blue (242) Loctite on the threads. The 6 MOA dot is plenty for defensive style shooting out to 25 yards. At 25 yard it will cover about 3/4 of an inch. Sighting in is easy, plenty of travel on each axis. I want to add irons that will just be visible in the window then I think I will start thinking of this as a HD gun. Keep in mind that if your glasses and or the optic are dirty the dot may star a little. No problem, but it may bother some people. I would like to see an option where it comes on when you move the gun. Only alternative is to leave it on (which I do) at the lowest setting which is plenty for indoor lighting. Hope this helps. Buy with confidence. Rated 5 out of 5 by DoubleH from Improved Accuracy! I mounted the Venom on a Glock 34 which is my primary handgun at the range and the one I use when teaching firearm courses. I always start and end my sessions shooting 10 rounds on an NRA pistol target at 25 yards (bulls). I had never used a red dot on a handgun and have to admit was getting frustrating sighting in at 25 yards, it's just different and I have many years shooting iron sights. Once sighted in I shot bulls and scored my highest score ever! I have been sold on the Venom since and plan on putting one on additional handguns. Rated 5 out of 5 by Mikeee from Awesome sight. I just had my gunsmith install a Vortex Venom on my Kimber Gold Combat and I absolutely love it. For years I've struggled with fuzzy front and rear sights. Now I can just focus on the target and the red dot which are both sharp and clear. It has brought back the enjoyment of going to the range. I plan to have another Venom installed on my Glock 23. Rated 5 out of 5 by Drock12 from From rifles to pistol I've been running my vortex venom for a bit over a year now, it started life mounted on a 10.5inch ar15 and then I moved it onto my gen 4 glock 19. This red dot is awesome, it stands up to everything I have thrown at it. Rated 5 out of 5 by ryan363 from Crisp, Clear Reticle!! I have the 3 MOA mounted on a QD mount on top of my 5.56. The reticle is extremely clear and crisp to the point where hitting 6" steel at 200 yards is not a problem. The adjustable brightness really helps during those hog hunts at dusk or transitioning from field to deep woods. Overall this product is built solid, has great features and helps me gain sight picture very quickly. In the Box lists Picatinny mount as included, product photo shows no mount. Just want to be sure mount is in fact included? Thanks! yes, there is a mount included, however, it is a low mount, so chances are you will want to get a riser mount to raise it up.